Cooling towers are used primarily to extract heat from a system through the cooling of a supply of water resident within the system. 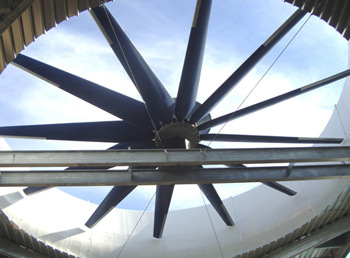 The water is moved in streams through the cooling tower and, with the movement of air over the water, heat is extracted and released to the atmosphere. The cooled water is then recirculated through the system and the process repeats itself. 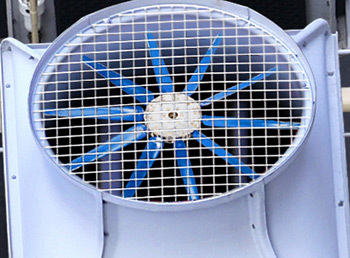 Air cooled heat exchangers employ the use of large industrial fans to create sufficient air movement to cool their internal coils and the liquid inside the coils. Returning this internal liquid to the environment where it is extracting heat completes the cycle. In its simplest form an air cooled heat exchanger is a series of pipes containing a liquid which is circulated through a process or atmosphere with excess heat. A condenser is used in industrial cooling systems to transform the coolant within the system from a gas into a liquid state. As refrigerant returns in a gaseous form to the condenser from the area being cooled, it carries with it excess heat extracted from the atmosphere in the cooled location. Typically heat exchangers surround a compressor. 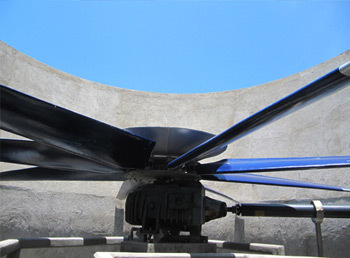 The gas flows through the heat exchangers, where it is cooled by one or more, large, powerful fans before being routed through the compressor, where it is liquefied. It is then pumped back through the system as a liquid, where its transformation into the gaseous state creates a cooling effect. As it turns gaseous, it flows through the system, picking up excessive heat and recycling again to the condensing unit to start the process all over again. An evaporator is the opposite of a condenser. Whereas a condenser transforms a normally gaseous chemical into a liquid form, an evaporator turns a normally liquid chemical into a gas, through the process of evaporation. 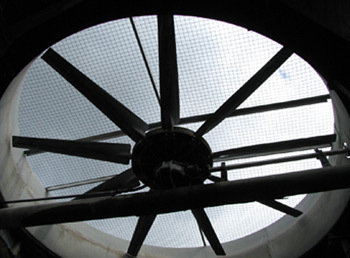 The most common example of the use of evaporators is in a steam system. The chemical in these systems is water. The water is fed into the evaporator where it encounters a heat source which evaporates the water into a gas vapor. In a steam heating system, this heated vapor is circulated through the area to be heated, where it circulates through tubing, or radiators. The vapor releases this built up heat into the atmosphere, heating the air, condensing the vapor back into water again, and then recirculating it back to the evaporator.